Book a Portsmouth Ferry to the French port of St Malo. 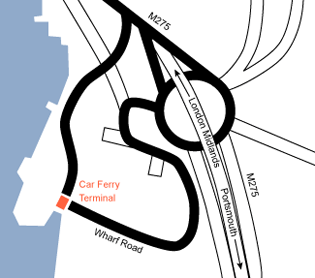 Book a Portsmouth Ferry to with Brittany Ferries. Book a St Malo Ferry ticket for your ferry crossing from the port of St Malo in the Channel Islands to Portsmouth port with the ferry operator Brittany Ferries. The St Malo ferry port benefits from an exceptional location at the heart of the Atlantic Arc. St Malo is an excellent gateway to explore further the delights of Western France, with fery connections available from the Channel Islands as well as Weymouth, Portsmouth and Poole. St Malo itself is an attractive destination for cruise ships, with streets replete with beautiful buildings and monuments that depict a rich historical tapestry. The front port of Saint-Malo has two recently-built and efficient ferry port terminals, which include a cafe, a number of souvenir and gift shops as well as a bureau de change. Cross-channel freight has greatly developed over the years, with good facilities for truck drivers and freight-haulers. Directions to St Malo Ferry port by car. By Road: A toll-free dual carriageway, the N137, connects St Malo to the rest of the France. 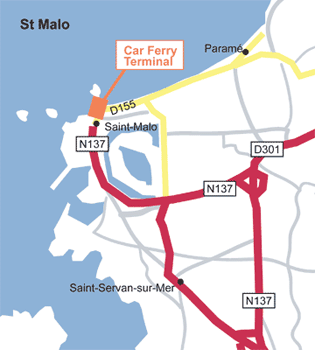 To get to the port, follow signs at each exit for St Malo to the Terminal Ferry du Naye.